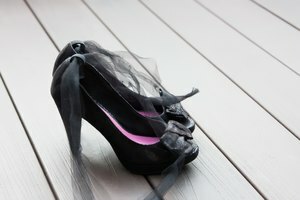 When shoes begin to hurt your feet, consider loosening the laces to give slack to the shoe. Many times the problem is solved quickly, and without pulling your foot out, by simply loosening the bow or knot. If the problem persists, which can be uncomfortable, then remove your foot and pull all the laces loose. You want to avoid walking or running in shoes that are too tight because it can damage foot nerves, according to Dr. Thomas Hecker, doctor of podiatric medicine. Take the proper steps to loosen the laces if the situation arises. Untie the shoe lace bow or knot. Once the shoe lace bow or knot is removed, wiggle your foot out of the shoe. Let your laces hang to either side of the shoe. Use your index fingers to wrap around the top laces that run between the top two holes, and pull upward. This will shorten the tying laces. Insert your thumbs into the shoe and pull the sides outward. The area full of laces will open slightly. Move down the laces to the laces that string between the next two holes. Pull the laces upward with your index fingers, just like the first set of laces. Open the shoe again. Repeat the process of pulling the laces upward, and opening the shoe, until the all the laces are loose. Insert your foot back into the shoe, and tighten according to your preference. The process can be done with your foot inside the shoe; however, the shoe will get tighter before it gets looser. Talk with your podiatrist or athletic trainer to find out the proper way to tighten and tie shoe laces. Shoes should feel comfortable on your feet, not tight.